Adding mixed numbers is often one of the last things taught in a fraction unit because students need a lot of prior skills in order to complete this operation. Keep reading to find out what prior terminology and background skills are needed and how you can teach this process at home or in the classroom. Before beginning a mixed number lesson, determine if your students know the following terminology. If not, introduce the missing terms, then help students visualize them using drawings and physical objects. Before they can add mixed numbers, students need to know how to perform the following processes. Math is a cumulative subject, so if you discover that they don't know how to do any of these processes, make sure to give a quick review lesson before moving on. Change the mixed numbers to their equivalent improper fractions. 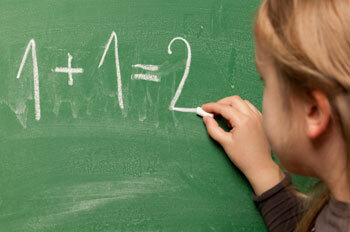 If necessary, change the fractions to equivalent fractions that have a common denominator. If whole numbers remain after finding equivalent fractions, add the whole numbers together. Then, add the fractions. Change the answer to its equivalent mixed number and, if necessary, reduce the fraction. For example, below are the steps for solving the problem 3 1/4 + 5 4/7. 247/28 = 8 23/28. The fraction can't be reduced. How Can You Teach Students to Add Mixed Numbers? When teaching students how to add mixed numbers, begin by introducing the problem using only numbers. Then, help students visualize the problem by introducing drawings. Follow the steps below. 1. Introduce mixed numbers using only numbers. For example, mixed numbers may look like this: 1 4/8, 1 5/8 or 3 1/2. 2. Demonstrate the concept with drawings. For example, use circles to represent whole numbers and fractions. The mixed number 1 ½ can be represented as one full circle and one half circle. Students can then count the circles to find the answer to an addition problem. 3. Combine the numbers and drawings using a problem. Present students with a numerical problem, such as 1 4/8 + 1 5/8. Then, use a drawing to help the students solve it. To represent the number 1 4/8, you would draw a complete circle and a circle divided into 8 parts. Make sure to color in the whole circle and four of the eight parts. Then, draw another complete circle and another circle divided into eight parts to represent the number 1 5/8. The whole circle and five parts of the divided circle should be colored. From this point, be especially careful to clearly describe what you are doing. Make sure that the students understand how the drawings can help them find the answer. Draw two circles to represent the whole numbers and a third circle that's divided into eight parts. To solve, count the number of parts in the partitioned circles. Because there's a total of nine sections, color the eight parts of the third circle and point out you have one more eighth remaining. Draw a fourth circle, divide it into eight parts and color one of them. You can then write the answer as 2 9/8, which can also be written as 3 1/8.